The purpose of the Professional Teachers’ Council (PTC) NSW member services is to provide efficient and effective administration support services to all member associations at the most competitive rates available. PTC NSW supports member associations by offering very competitive ‘actual cost’ rates for member services by eliminating a number of employer expenses for associations (e.g.) leave entitlements (annual leave, sick leave, long service leave), superannuation, insurance costs etc. An effective, efficient and cost effective plan will remove the burden of the administration of your association from your volunteer staff at an affordable cost to members. To discuss your association’s needs, please contact the PTC NSW administration office on (02) 9716 0378. 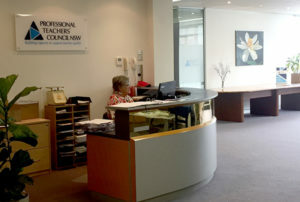 The Professional Teachers’ Council NSW office has moved to new facilities providing even more quality professional office space for member associations’ use including permanent and casual alternatives. Conveniently located within walking distance from Auburn Station, bus, M4 and Parramatta Road the spaciousness of the office allows PTC NSW and the member associations of English, Geography, Mathematics and Science to work side by side in a professional environment. The quality fit‐out provides a professional presentation for all member associations to access either casually for meetings or as temporary work space. Our new facility has greater flexibility to enable large group presentations during the week and on weekends. Break out spaces for small groups as well as a 120 seat auditorium enable PTC NSW and our member associations with flexible spaces in which to present! When you are planning your events consider our new facilities in Auburn! Call our office and talk with us about your association requirements – we just may be able to assist! Talk to us on 02 9716 0378 or admin@ptc.nsw.edu.au to discuss your requirements.